The usual horror tropes (fantastic monsters, ancient curses, Axe-Crazy maniacs, etc.) do not always work because this is too distant from what we may encounter in everyday life. Therefore some creators use the Mundane Horror. The idea is to portray a seemingly comforting and everyday scene, but with some minor details which somehow "do not fit" and have very dark implications (i. e. that the character is really in a Dark World, or we're looking Through the Eyes of Madness, or it is all a Dying Dream). A common way to do this is to take a normal scene then apply effects to it. For example, a group of children jumping rope is innocuous or even heartwarming in normal contexts. Slowing the footage down, making it black and white, desaturating the colour balance, blurring parts or all of it - or a combination thereof then altering the soundtrack so it's Creepy Children Singing an Ironic Nursery Rhyme instead of the normal lighthearted jumping cadence and you get a totally different effect from what is ostensibly the exact same scene. Often features a Wham Line or a Wham Shot, and may overlap with Crapsaccharine World and Surprise Creepy. Can sometimes result in Fridge Horror if you don't immediately see the weirdness. A frequent result of A Glitch in the Matrix. See also Uncanny Valley, when this trope is applied to human characters. Mister Miracle (2017) frequently juxtaposes mundane domestic drama between Scott Free and his wife Big Barda with the backdrop of an apocalyptic war between the New Gods, to jarring effect. Even the most casual conversations are frequently disrupted by bizarre format shifts that make the reader question what the hell is going on. Joker manages to make The Joker casually eating shrimp into something utterly revolting and unnatural. Also, if you pay attention to the background, youll notice that some of the gargoyles on Gothams buildings arent actually gargoyles. Jacob's Ladder is a master of "Uh, did I just see that?" moments. A nurse with a bone sticking out of her head, a creepy-looking sandwich in a fridge at a party, blood in a sink in a public toilet, etc. In Twixt, the protagonist, who is interested in the biography of Edgar Allan Poe, comes to the hotel "Chickering" where Poe used to stay. He is met by a very eccentric family couple who say weird things about "graves in the floor" and sing the song "The Big Rock Candy Mountain" which sounds decidedly creepy in the context. It turns out it was all a dream, and when he comes there at daytime, the building is abandoned. Lost Highway: The main character goes to a party and is approached by a pale man with black lips and eyes. The sounds of the party go silent. The man then says they've met before, at the main character's house, and that he's there right now. The Mystery Man: [producing a cell phone] Call me. Dial your number. Go ahead. The Mystery Man: [over the phone] I told you I was here. 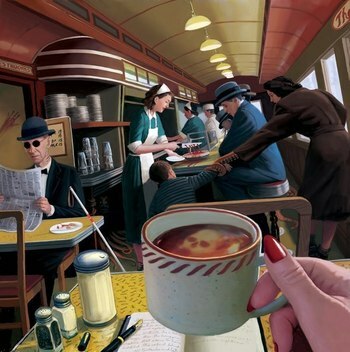 The "When you see it" meme: seemingly ordinary photographs which include one or more small decidedly creepy details. In The Landlady by Roald Dahl, there's a nice small hotel with a friendly host. It has only two guests who are still there though they checked in more than a year ago, and are "known for one and the same thing" (having gone missing); the host gives her guests tea which tastes like Bitter Almonds. Guess the implications? In Crouch End by Stephen King, a family couple drives into an unknown district of London. Initially it appears almost normal, but with some minor unsettling details (a strange newspaper headline, a cat with a mutilated face, three bikers who appear to have rat heads). These are the first indications that they are in a Dark World. In episode 9 of Twin Peaks, Donna delivers a meal to an old lady Mrs. Tremond and her grandson. They say cryptic things, the grandson, who is "studying magic", makes creamed corn disappear from the tray, and the whole scene has a very unsettling feel. Next time Donna comes to visit them, they are not there, and a completely different person lives here. Some of the more realistic levels of Sanitarium have this. A seemingly normal American town which has no adults and is full of disfigured children, a mental asylum with friendly guards and patients, with one of them cheerfully telling you that she "ate her husband with carrots and rice", etc.